Stretched canvas prints can be easily fitted into a picture frame. Several methods are available, but one of the easiest is probably the use of offset clamps. These are little metal steps that come in varying step sizes of 3.2mm, 6mm, 9mm, 12mm, 18mm, 25mm, 31mm. The clamps are all approximately 10mm wide. The different depths of step are available in order to accommodate most common depths of stretcher bars on canvas prints. The frame may also include a slip which will decrease the depth of the frame rebate and require the use of a smaller clamp size. 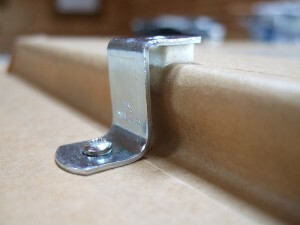 The stretched canvas is placed into the frame and each clamp is screwed down (by use of #4 zinc plated screws) in close proximity of the stretcher bars of the stretched canvas in order to hold it in place. 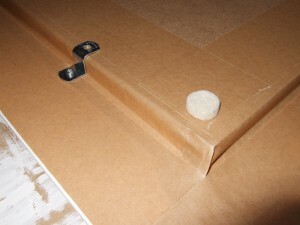 If the step ends up being in between a step sizing, you can use small pieces of felt in order to pad out the spacing. Typically to finish a framed canvas print I will be finish it off as shown below by placing the stretched canvas in the frame, then placing a backing board (2mm MDF) on to it, taping in place with ECO15 or ECO 25 frame backing tape then clamped down in 2-5 places on each side (depending on canvas size) with the offset clamps. 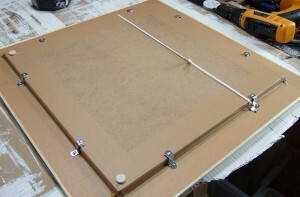 Once offset clamped on all four sides, the canvas will be securely fitted in the picture frame, and will be ready to attach a hanging solution in this case D-Rings and cord. In order to keep the metal backs of the offset clamps from scratching a wall surface / paintwork, two small round felt pads can be placed on the bottom corners of the frame as shown which will keep the clamps from being in contact with the wall. Alternative solutions include spring retaining clips, z-clips or bendable brass plates. All of these items including offset clamps can be purchased from our Picture Framing Hardware for Canvas section of our store. This entry was posted in picture framing information, stretched canvas framing and tagged stretched canvas, stretched canvas framing. Bookmark the permalink.